UAE authorities investigate massive fire adjacent to world's tallest building on New Year's Eve, as smoke continues to cover the hotel. A full 12 hours after a massive fire began engulfing Dubai's upscale The Address Hotel at 9:30 p.m. on New Year's Eve, the smoke continued rising from the still smoldering building on Friday morning. 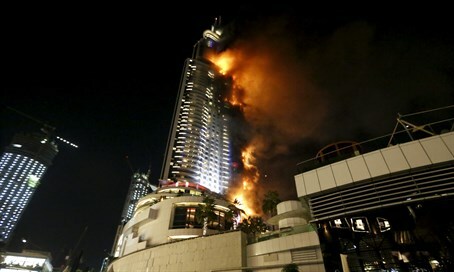 United Arab Emirates (UAE) authorities are investigating the huge conflagration that broke out on the 20th floor of the 63-storey five-star luxury hotel and apartment complex, which is located just across a plaza from the Burj Khalifa, the world's tallest building. Four firefighter crews managed to get the fire under control, but the massive tongues of flame that were accompanied by the sound of explosions from inside the building were replaced by huge trails of smoke on Friday morning. Firefighters were mostly watching the smoldering structure from the ground on Friday, and at one point unsuccessfully tried to use a water hose on a ladder firetruck according to the Associated Press. Reportedly the fire has been put out on the top floors of the building, but the flames linger lower down. "The left side of the hotel is completely gone. There was a minor stampede - panic set in and people ran away," reported Diana al-Rifai, a journalist on the scene for Al Jazeera. The news site reported that all roads to the hotel remain blocked off on Friday, adding that the luxury hotel is usually full of locals and foreigners congregating to watch the huge New Year's Eve firework display from the adjacent Burj Khalifa. That stunning firework display went ahead as scheduled despite the blaze and the evacuation of the plaza between the two buildings. In the course of the fire and the evacuation of the luxury hotel on Thursday night 16 people were wounded, most of them with minor injuries. The government revealed that one injured person suffered a heart attack caused by "overcrowding and smoke." The Address Hotel stands 300 meters (1,000 feet) tall, while the Burj Khalifa is 829.8 meters (2,722 feet) tall, making it the tallest skyscraper anywhere on the globe.